Peoples-Jones made all types of grabs on Saturday and when his team needed plays on late down situations, he was the man targeted. The sophomore wide receiver finished with seven catches for 64 yards against the Buckeyes. Peoples-Jones isn’t afraid to make catches over the middle but will be a problem at the next level on the outside because o f his quick feet and his ability to accelerate and de-celerate to relieve himself of tight coverage. For the season, the sophomore has caught 39 passes for 541 yards and seven touchdowns. The sophomore is also a threat as a punt returner (two career punt return touchdowns and averages 9 yards a return). Chase Young (No. 2 pictured) has 5.5 quarterback sacks and 10.5 tackles for loss for the Buckeyes entering the 2018 Big Ten Championship game. Michigan came into Columbus with the nation's top-ranked defense and a huge reason why was because of their ability to pressure the quarterback with four men. However, by games end, Ohio State’s offensive and defensive line had stolen the show. The Buckeyes didn’t give up a sack and sacked Michigan junior quarterback Shea Patterson (6’2, 205) three times. 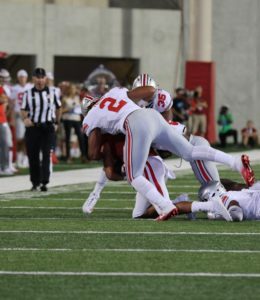 In the fourth quarter on 3rd and 12, Buckeyes defensive end Chase Young (6’5, 265) flushed Patterson from the pocket and made him throw off-balance, which led to an interception by junior safety Jordan Fuller (6’2 204). Defensive linemen Robert Landers (6’1 283) and Jonathon Cooper (6’4 257) also contributed with sacks. 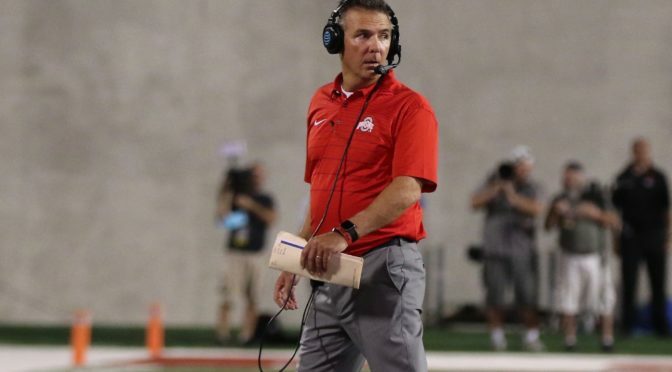 Offensively, the Buckeyes rushed for 249 yards and passed for 318 yards. "They slowly devastated us throughout the game. Knowing all the yards they were putting up and how easily they were scoring, it was tough. It was very tough," Michigan senior defensive back Tyree Kinnel said in a post game press conference. "They completely beat us everywhere. Run game, pass game, everyone is to blame." Haskins has set Big Ten passing marks for passing yards (4.081) and touchdown passes (42) in 2018. 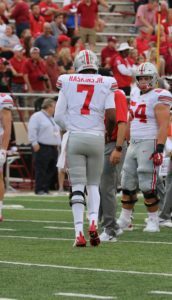 Haskins seems to be getting more and more comfortable as the season goes on. The Potomac, Maryland, native completed 19-of-30 passes for 318 yards and five touchdowns on Saturday. Despite the big game atmosphere, Haskins never forced any throws against a stout Michigan defense. Aided by a strong running game and a clean pocket, he picked the Wolverines apart. Haskins has the arm to make all the throws and is big enough to shake defenders off. If the sophomore can continue to play with the poise he showed on Saturday, look for him to continue to move up future NFL Draft boards. 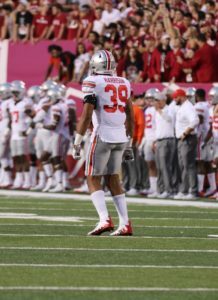 Harrison has contributed 8.5 tackles for losses for the Buckeyes in 2018 (as of 11/27/18). Harrison impressed with his form tackling ability against the Wolverines. 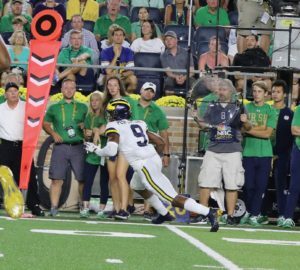 The junior linebacker used his eyes well and was able to make tackles on Michigan senior running back Karan Higdon (5’10 202) by being patient and meeting Higdon in his running lanes. Harrison can also be used in blitz packages. He sacked Patterson on the second play of the game when he came into the backfield untouched. For a player his size, Harrison has excellent sideline-to- sideline ability yet is strong enough to take on interior linemen in the running game. Harrison projects best as a 4-3 outside linebacker.